Time for another installation of my Project Series. It has been awhile. However, if something screams the necessity for a Project Series installment, it is Summer. So welcome to the first of my Summer long Project No More "I'm Bored!". Over the Summer I will popping by once a week with an idea to help with the I-am-bored-itis. 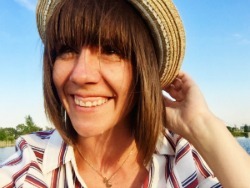 I am hoping that it not only cures this particular epidemic among the kiddos, but I am also hoping that it goes towards decreasing the cases of pull-out-my-hair-itis that us moms can get during the Summer. 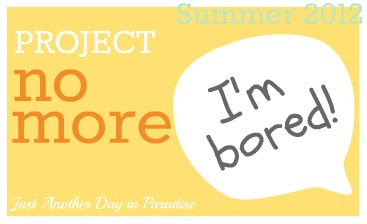 Let's have a fun Summer and get rid of the phrase "I'm bored! "...at least one of the twenty times we hear it. First fill each little bottle with vinegar. Then add a couple of drops of food coloring into each one. Next distribute the baking soda between several bins. I used two boxes for four bins. Give them the squeeze bottles and let the fizzy fun begin. Seriously, let 'em go crazy. There was an added bonus at the end that I wasn't anticipating. The colored vinegar and the baking soda actually mixed to what amounted to a textural fun land. My boys thought it felt like Moon Sand. Even though it wasn't exactly like Moon Sand, they still had fun digging, molding, and throwing (yes throwing) it. Last one not recommended. Big ol' mess. However, it did totally cure the afternoon of "I'm Bored!". Enjoy your Summer one day at a time! I think we'll use this one for our mad science week!